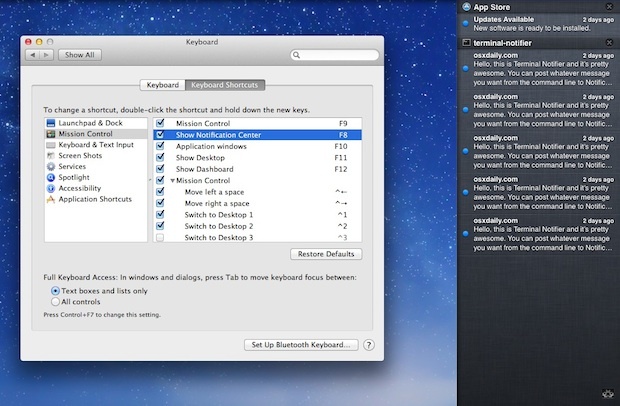 Want to open Notification Center with a keystroke on the Mac? It can be done by setting up a custom keyboard shortcut. Typically Notification Center of Mac OS X can be summoned either with a click of the menu bar item in the upper right corner, or a two-fingered swipe left on a trackpad, but you can also set a custom keyboard shortcut to see your notifications or alerts on the Mac. You can set any keystroke you want for accessing Notification Center, just be sure it does not conflict with another command or process on the Mac. F8 is a good key shortcut to assign for Notification Center since it doesn’t serve a use otherwise outside of iTunes, but you can set it to whatever you want, just be sure it doesn’t conflict with another keyboard shortcut that you use often. You can also assign multiple keystrokes to see the notifications if you want, but it’s probably better to reserve other keystrokes for other custom keyboard shortcuts you may want to setup on the same Mac later. As a Mac user who tends to spend a lot of time in Terminal and typing in general, I find keyboard shortcuts to be much faster than using touchpad gestures or the mouse to click the icon. But everyone is different, so try out the keystroke method versus clicking the Notification Center icon, vs the four-finger side swipe, each of which accesses notifications center in Mac OS. Now that Notification Center is part of both Mac OS X and iOS it’s more useful than ever, check out some more tips on the topic if you’re interested. Is there a way to turn on/off “Show Alert Banner” with keyboard shortcut? Any terminal hacks for completely disabling it?? I just don’t want it running on my system at all. Paul, I think the best you can do for now is drag *everything* below the ‘do not show’ line. I shall have a rummage around and see if I can find a quick solution to completely disabling it. This is a great tip. For some time now I have had Dashboard fully disabled making my F4 key utterly useless, but with this tip, along with FunctionFlip I was able to remap the key to open Notification Center. Works like a charm! My favorite tool to control and manage all my shortcuts is BetterTouchTool: http://www.boastr.de/ A fantastic OSX tool that lets me assign actions by application or globally.